It’s December when the idea for the trip first surfaces. Travel to Samoa on an expeditionary fishing trip with hopes of large GTs and other salty species? Sure — why not? I’d been to the South Pacific before and fallen in love with the place. The heat and the salt gets in your blood and never lets go, an islander once told me. I completely agreed. Three months later, I’m slogging the camera gear through 100-degree heat and searching the water for any sign of fish. It’s day three in Samoa, and we have yet to bring any fish to hand. 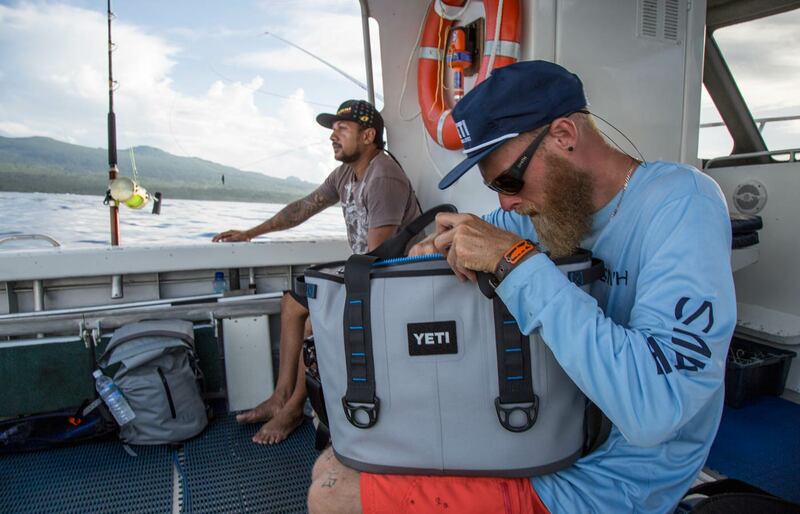 Working with Australian angler Jonathan Jones, we’ve devised a battle plan that would cover the flats, the reef edges, and even the blue water surrounding the volcanic island. We’ve seen a few GTs, but nothing had come to play. Things improve. A little. We get into some mahi-mahi offshore. A wahoo. A small GT. But nothing like what we’d hoped. Sometimes it happens — we’ve both fished long enough to understand that fact. But it’s brutal when you’re halfway around the world and things don’t come together. We make the most of it — logging dawn-to-dusk hours every day, trying every angle we can devise. And when it’s time to go home, we laugh it off in the knowledge the next trip will be better. Jonathan returns to Australia, ready to chase fish in the familiar waters near his home in Sydney. After three days of travel, I make it back to Montana, almost immediately heading to an old, familiar spot on one of my favorite waters. Surrounded by snow, on the third cast I hook up with a healthy rainbow trout and laugh aloud. It’s a far cry from swimming in the ocean trying to photograph a leaping mahi-mahi. Fishing…and the places it takes us. Jess McGlothlin is happiest on the road in the weird, far-off corners of the world. She sees her mission as a simple one: tell stories. Working as a freelance photographer and writer in the outdoor industry, while on assignment in the past year she’s learned how to throw spears at coconuts in French Polynesia, dodge saltwater crocodiles in Cuba, and eat all manner of unidentifiable food. See more of her work at JessMcGlothlinMedia.com. Swells above, fish below. Several colorful mahi-mahi come to play while we dodge thunderstorms in the channel between Upolu and Savai’i, the two islands that comprise the country of Samoa. Barely escaping Apia Harbor just before a torrential rainstorm, we begin the hunt for giant trevally. These pilot whales offer a friendly welcome as we cruise past. As the sun dips below the horizon, local fishermen head out in search of dinner and perhaps a little bit extra to sell the next day at the ever-popular roadside stands. Samoa exists solely on island time, and evenings are for laying out in fales, the open-air huts that dot the island, spending time with family and generally just lounging. Agelu Hale BBQ becomes a favorite stop of ours. Nine tala — roughly $4 U.S. — buys a massive plate of mystery meat in a delicious sauce, green bananas, and, on the rare occasion, rice. Samoa: a land of volcanoes, jungle, heat, and salt. Sunsets are a blaze of color, and as darkness falls the stars pop out, but the day’s heat remains. When the dockside GTs snub your first few attempts, time to change it up. A personal, portable, anything but soft-sided cooler that can easily transport at least 18 icy cans to your next adventure. Mean-mugging their way through the shallows, these GTs refuse everything Jonathan threw at them, once again proving they’re on their own program. A promising underwater drop-off reveals no fish, and I spend much of the time in the water working to get the right perspective on the boat with the small island behind. To Sua Ocean Trench, a giant swimming hole connected to the ocean by an ancient lava tube, rests a massive 100 feet in the earth. Those who brave the slick, steep wooden ladder down are rewarded with cool water and an otherworldly jungle experience. 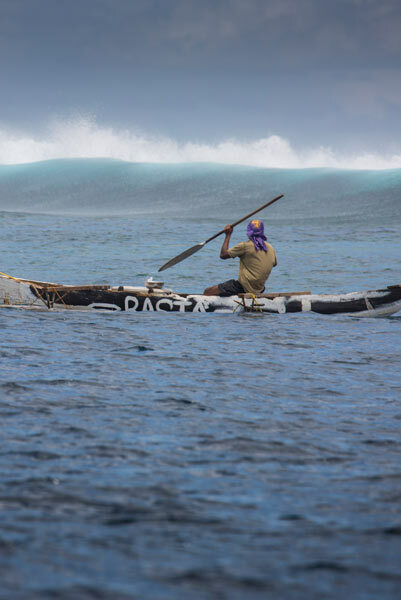 Fatu, a local with a small boat, tells us on no uncertain terms he knew where the fish are. Ignoring a looming storm front, we head out in search of blue water fish, and then move inshore to the reef in hopes of GTs. Small black-tip reef sharks patrol the hills and valleys of the coral. From volcano to rock to sand to sea — that’s Samoa in a nutshell. Travel to Samoa on an expeditionary fishing trip with hopes of large GTs and other salty species? Sure — why not?